Seattle Banner Plane Advertising, Blimps, Sky Writing, And More! Looking to start a new marketing campaign in the Northwest? 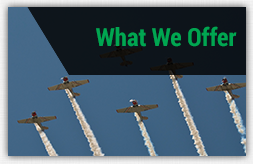 If so, aerial advertising in Seattle, Washington is what you need. As home to the 2014 Super Bowl Champions, Seattle is the perfect market for you to reach the sports demographic. CenturyLink Field, where the Seahawks reside, holds over 67,000 individuals. Marketing your brand either via aerial banners, sky written messages, or blimps, at this venue is great way to catch the attention of the crowd. CenturyLink Field is not just home to Seahawk games, but also to hundreds of other concerts and events. 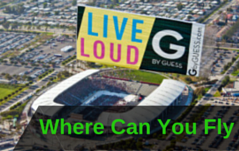 Whether it is a football game or a popular country music festival, your aerial advertisement at the venue would hardly go unnoticed. Seattle doesn’t just attract crowds based on their team’s football stats, perople are also drawn by the culture surrounding the city. Olympic Sculpture Park, for example, is an outdoor art museum that reels in thousands of individuals daily. The grounds location, right on the water, is the ideal spot for flying an aerial advertisement. The park’s staff might even get jealous because the aerial advertisement, whether banner, blimp or sky written message, is a piece of art in itself! Ready to dive in to the aerial media world? 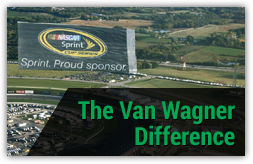 Our representatives at Van Wagner Aerial Media are ready to help. Contact us with any questions, or click below to receive a free quote! Find out why our advertisers return to us over and over again. 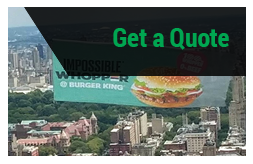 Click below for your free aerial banners, blimps, sky writing, or balloon advertising quote today!